Kolkata:Indian Institute of Management Calcutta the first Indian business school crowned with triple international accreditations by AACSB (Association to Advance Collegiate Schools of Business), AMBA (Association of MBAs) and EQUIS(the three major international accreditation bodies for Business Schools) celebrated its 52nd Convocation at the campus today. The landmark ceremony was graced by the presence of Shri. 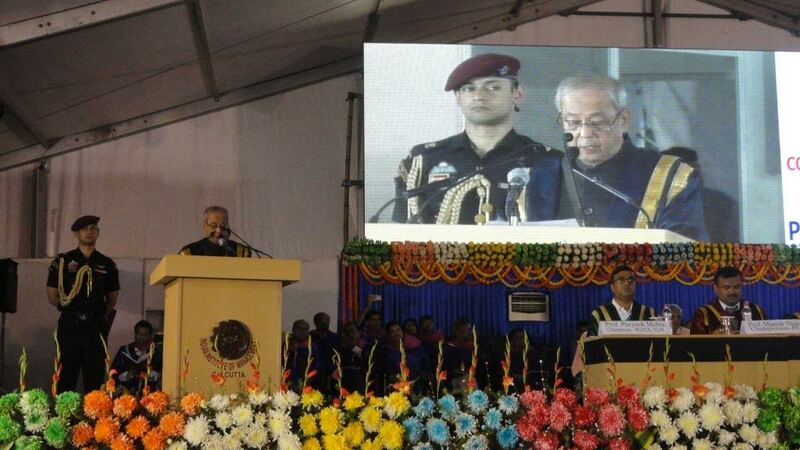 Pranab Kumar Mukherjee, Hon’ble President of India as the Chief Guest, in the august presence of Mr.Ajit Balakrishnan, Chairman of IIM Calcutta’s Board of Governors and Prof. Saibal Chattopadhyay, Director, IIM Calcutta. This year Diploma was awarded to 434 students graduating in Post Graduate Diploma in Management (PGDM) followed by 68 students in Post Graduate Programme for Executives (PGPEX) and 40 students in Post Graduate Programme for Executives for Visionary Leadership in Manufacturing (PGPEX-VLM). The institute also conferred 13 students with the Fellowship Programme diploma. After the commencement of the convocation with the opening remarks and the lighting of the lamp by the eminent dignitaries, students were felicitated with awards and prizes. For achieving the academic excellence, students were honored with the Gold, Silver and Bronze medals by Shri. Pranab Mukherjee followed by his congratulatory and inspiriting convocation address to the future corporate leaders graduating from the premier institute. Under PGDM programme, Soumyasree Chakrabortywas awarded with the Dr.B.C.Roy Gold medal for being the first rank holder. She won Aditya Kashyap Memorial Scholarship for receiving highest CGPA in Compulsory and Elective Courses as well as Late Sumantra Ghoshal Award for Academic Excellence for receiving highest CGPA at the end of the two-year programme including all six terms. Under PGPEX programme, Pamela Ghosh won the Gold Medal sponsored by the Calcutta Chapter of the IIMC Alumni Association for being the first rank holder. She also won the Institute Book Prize and the Book Prize sponsored by Taylor& Francis Group and her name will appear in the Director’s merit list. Pamela also won The Rising Star Award of Academic Merit for PGPEX Students and a cash award of Rupees one lakh, sponsored by the Shapoorji Pallonji Group. Under PGPEX-VLM, Subrata Kumar Mahanty was awarded with the ACC Ltd. Gold Medal for ranking first and his name will feature in the Director’s merit list. In Fellow Programme, Anjan Ghosh won Satish K. Sehgal Doctoral Student Award.